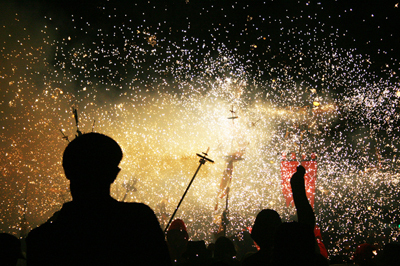 If you’re wandering through the streets of any Catalan city or town and you suddenly hear loud explosions and see incandescent, spitting flames you could either run for your life… or stay and enjoy the Correfocs! 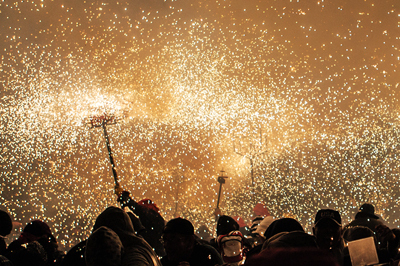 Correfocs literally means “fire runs”, and it’s a fairly apt description. 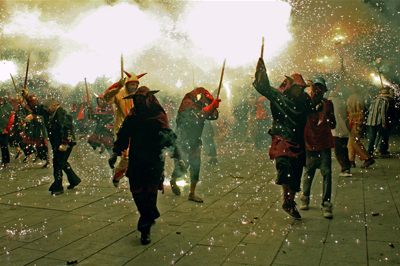 People, dressed up as devils, light fireworks that are attached to their tridents… but instead of running they dance to the rhythm of drums. 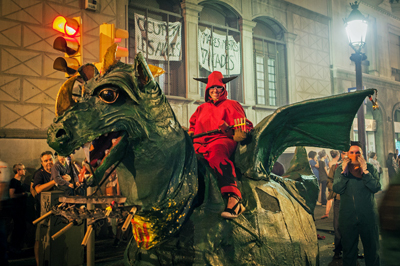 Almost every Catalan town (and neighborhoods of the big cities like Barcelona or Tarragona) have their own “colla” or gang of Correfocs, with their own costumes and original fire beasts that can be dragons, horses, demonic bees or even Gaudi’s famous lizard from Park Güell. 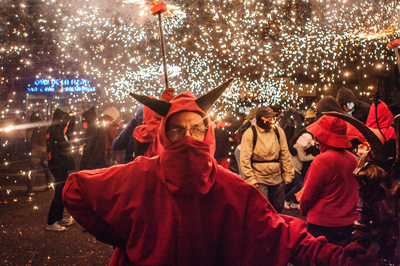 Depending on the festival, a Correfocs might consist of just a small bunch of devils and minor explosions, or it might involve an entire demonic army of hellish beasts, dancing through the crowd until they end the infernal celebration with the “traca final”, by the lighting all their fireworks at the same time. 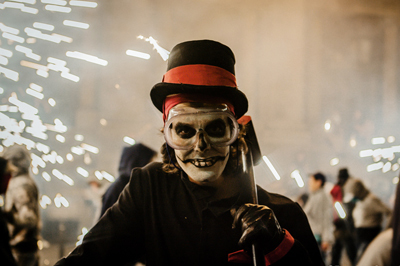 This is spectacle worth seeing… even though it may leave you deaf by the end. 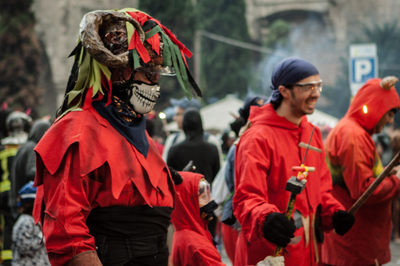 As scary as it sounds, taking part in the Correfocs celebrations is fairly safe. 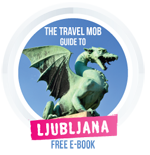 But of course, you’ll have to follow some security measures first: It’s very important that you cover as much as you can your body, especially your hair! 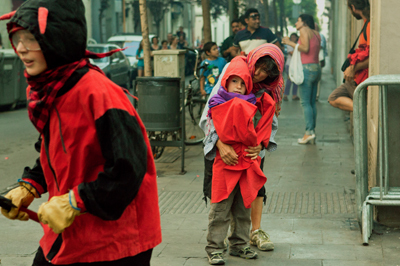 Even if it’s the middle of the summer, wear a long sleeve shirt or a sweater, pants (jeans would be the best option), a hat or hoodie to prevent your hair from catching fire and forget about the flip flops and put on some shoes. Try to cover your eyes with some goggles (your glasses or shades could work too) and your mouth and nose. No need to say that flammable materials like lycra should stay in the closet, and wearing your favorite shirt that you love with all your heart is not a good idea… it’ll probably end up full of dark, smoking holes! Also, follow the rules and regulations at all time, if you’re overwhelmed by the loud sounds at any time, try opening your mouth for a while. 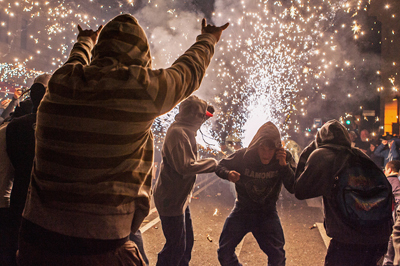 Correfocs are usually friendly and sometimes they’ll encourage you to dance with them, but don’t try anything stupid… there’s no way possible that they’ll let you handle the fireworks… so don’t even try it. 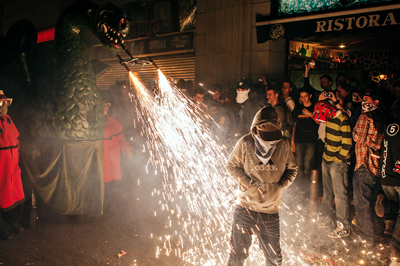 Watching the Correfocs from a distance is also a good and even safer option. 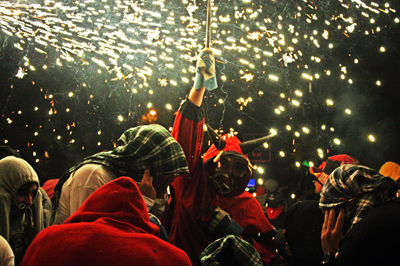 Oh, and there are also kids, or “collas”, of Correfocs, that most of the time go before the adults. 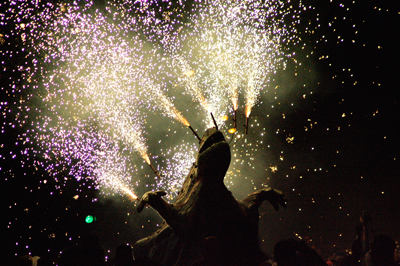 You might think that these little imps would be less dangerous, with their tiny sparklers, but whilst the grown ups lift the tridents over your heads, there’s a greater chance that the kid with his little arms will put the sparks right at your eyes’ height! 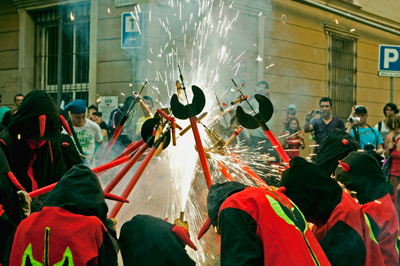 If after reading all this you feel daredevil enough to take part of this burning celebration, I’d recommend you to come to Barcelona in September and join the major Correfoc event that takes place during the amazing La Mercè festival. 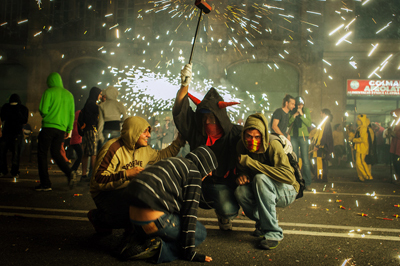 Words and photos by Francisco Goncalves. 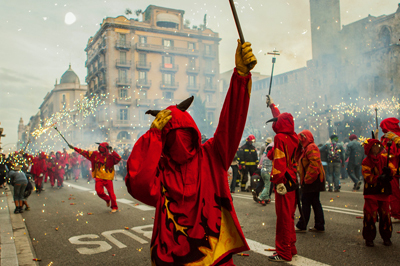 For more Catalan craziness check out our weekend guide to Barcelona, and other stories from Catalonia.